Shows » What Do Desert Birds Drink? Even when water is scarce, these birds survive! In the desert Southwest, water can be scarce. 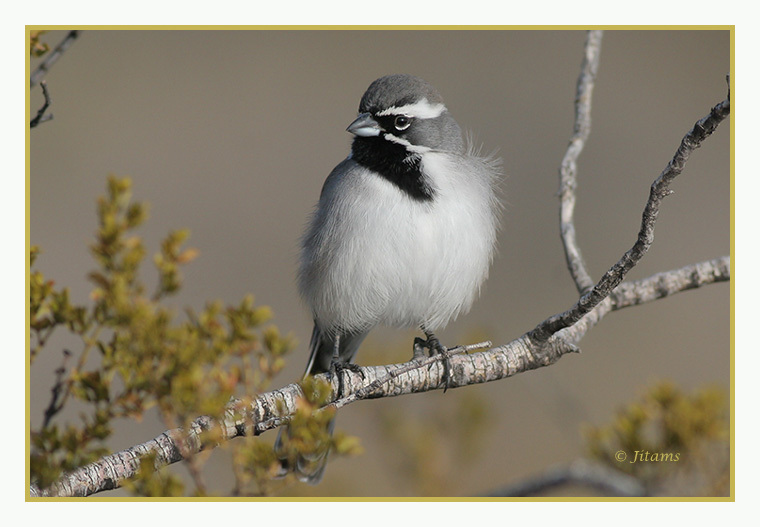 Yet some birds, like this Black-throated Sparrow, thrive in a scorching landscape. The birds obtain moisture from foods like nectar and fruit, as well as insects and other prey. They tuck into the shade in the heat of the day, so they won’t lose water in panting. And they have extremely efficient kidneys, so they excrete almost no liquid. Amazing! In the desert Southwest, summer temperatures sizzle, rising well over 100 degrees. And in some parts of the desert, there is not a drop of water for miles. Yet some birds thrive in this scorching landscape. Here a Black-throated Sparrow sings from a thorn scrub. [song of Black-throated Sparrow] Now, a Cactus Wren announces itself atop a barrel cactus. [Cactus Wren song] And neither will be flying miles every day to the nearest source of water. So how do they survive? Birds, like all animals, perish without water. Desert birds, however, make the most of very little. They tuck into the shade in the heat of the day, so they won’t lose water in panting. They have extremely efficient kidneys, so they excrete almost no liquid. And they obtain moisture from foods, like nectar and fruit as well as insects and other prey. [Insect sounds and Black-throated Sparrow song] Even when eating primarily seeds, Black-throated Sparrows are able to extract enough water from this dry food that they may never need to take a drink. Still, when that next late summer thunderstorm arrives, you have to think those temporary puddles are going to look mighty refreshing. Soundscapes featured in today’s show were recorded by Gordon Hempton and provided courtesy of QuietPlanet.com. Listen again at BirdNote.org. Bird sounds provided by The Macaulay Library of Natural Sounds at the Cornell Lab of Ornithology, Ithaca, New York. Back throated sparrow  and cactus wren  recorded by G. A. Keller.